“It introduced me to an amazing group of educators around the world. It opened my eyes to the range of classrooms and contexts in which English is taught. It gave me ideas for my classes. It led me to start my blog and to many of the posts on it. It took me to conferences. I stole the words above from the blog post I wrote to celebrate #ELTchat’s 5th birthday in October 2015. As you can see, I feel pretty strongly about it, so thought it was high time I introduced you to the wealth of knowledge and the range of people you can access through this amazing resource. #ELTchat happens on Twitter every Wednesday during the September-June school year and is an hour-long live conversation on a topic suggested and voted for by participants over a couple of days before the chat starts. A few volunteers moderate the chat to keep the conversation moving. At the end of the hour, a moderator downloads the transcript containing all of the tweets, and a participant from the chat volunteers to summarise what was discussed. All of the summaries are then added to the index on the ELTchat website: http://eltchat.org/wordpress/eltchat-summaries-index/. This resource shows you the wealth of topics which have been covered in the chats since they began. Even if you aren’t interested in joining Twitter and taking part in the discussion, I’d heartily recommend investigating the summaries because there will definitely be something useful in there for you. The first #ELTchat took place on 15th September 2010 with the topic ‘How do we best motivate learners to practise outside the classroom?’ Over time, the hashtag has evolved. Originally, there were two chats every Wednesday, one at 13:00 and one at 21:00 UK time, GMT or BST depending on the time of year. This reduced to one chat at the beginning of 2014, alternating between the two times. Recently it has moved to just one slot at 19:00 UK time, though do check on the website or by sending a tweet including the hashtag if you’d like to join in, as it may not be the last time it moves! The team of moderators has also shifted over time, starting out with Marisa Constantinides, Jason Renshaw, Andy Chaplin, Bernadette Wall, Barbara Sakamoto and Shelly Terrell, who represented all four corners of the globe, including Greece, Japan, Germany, the UK and Australia. Marisa is still moderating, and has been joined by IH’s own Shaun Wilden, plus Hada Litim, Angelos Bollos and Sue Annan. The hashtag was inspired by #edchat, a conversation for educators in general, with some of the participants of those chats deciding to create one specifically for English Language Teachers. It was clearly the right move as it has gone from strength to strength, and was shortlisted for an ELTons award in Innovation in Teacher Resources in June 2012. As well as the chats on Twitter, you can also visit the website at www.eltchat.org and the Facebook page. There are even some accompanying podcasts available, which were put together by James Taylor between January 2012 and June 2014. Anybody with a Twitter account can take part in the chats by sending a tweet including the #ELTchat hashtag. During the hour of the main conversation, it can be quite intense and very fast-paced, so it’s normal to ‘lurk’, reading the tweets but not participating, for a few chats before you dip your toe in the water. Sometimes it helps to use another app, such as Tweetdeck (see left) or Hootsuite, so that you don’t need to constantly refresh your Twitter page. It took me about three months of lurking before I downloaded Tweetdeck, at that time a separate piece of software, but now available in your browser. Since I joined in that first time, I’ve never looked back! Here’s one topic from each of #ELTchat’s almost six years so far to give you a flavour of what we’ve discussed so far. You can find all of the summaries by following the index link above. As you can see, topics come from all aspects of teaching, covering skills and language, tools we can use, different contexts and life inside and outside the classroom. Every chat is full of useful tips and links are shared to help you find out more, including suggestions of useful books and articles to read, not just online materials. If a topic you’re interested in doesn’t appear in the summaries index yet, why not suggest it for a future chat? 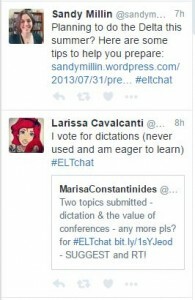 One of the other wonderful things about #ELTchat is that it isn’t just a resource during the chats themselves. Throughout the week, people share useful links using the hashtag, such as to blogposts and webinars. You can see these even if you don’t have a Twitter account by going to https://twitter.com/hashtag/eltchat. It’s a great way to find out about teaching blogs, technology tools and useful people to follow on Twitter. It’s led me to many of the resources and ideas which I share in this column, either directly through the hashtag, or indirectly through the people I’ve met by participating in the chats. I hope I’ve persuaded you to join us soon!